EXAR has its own magazine, the annual appearing “Experimentelle Archäologie in Europa – Jahrbuch”. In the magazine the lectures of the conferences are published and distributed to a broad readership. In the Oldenburger Series -”Experimentelle Archäologie in Deutschland”- ten volumes are published. Most articles are published in German. They are sometimes accompanied by summaries in English. English articles will always be accompanied by German summaries. Since 2002 the volumes “Experimentelle Archäologie in Europa” are edited by EXAR and continue the tradition of ”Experimentelle Archäologie in Deutschland”. The authors of the articles present their experiments and attempts, give information to archaeological reconstructions and express themselves to the education of archaeology by experiment and theoretical considerations on experimental archaeology. A selected example is given here. The contributions are written in German and in English and contain summaries in the other language. 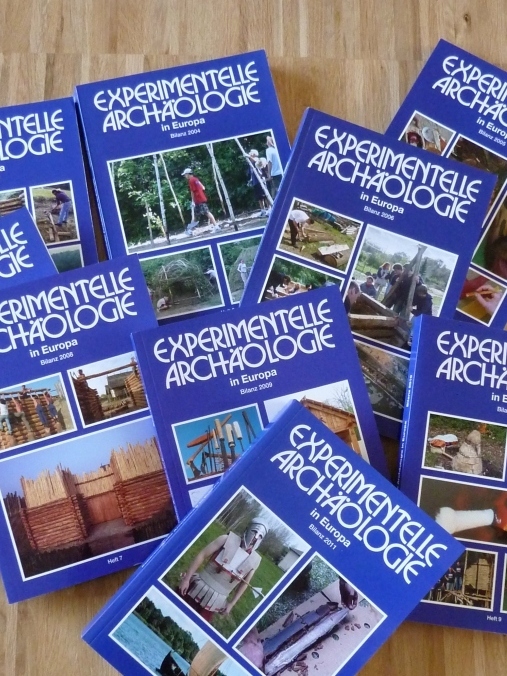 The first issue of “Experimentelle Archäologie in Europa – Experimental Archaeology in Europe” was published in March 2003, being the Proceedings of the 9th Conference, which took place in 2001, in Eindhoven (NL). The complete list of issues since 2003, including reviews, are found here. Rules for writers are to be found here. Occasionally the Museum in Oldenburg and later on EXAR has published special issues on experimental archaeology, education and museum. An overview is published on “Special issues“. Membership of EXAR includes a free shipment of one annual issue anywhere in Europe. Check for a special Autumn Conference Offer the Membership Page. All books can be ordered online via www.pfahlbauten.de/shop, where also the tables of contents of the individual volumes can be seen. Please consider also our special offers.